What does it take to build a story? Do you need a magic formula, or can anyone do it? In Also an Octopus, Maggie Tokuda-Hall encourages young storytellers, showing them that every story begins with "just a little bit of nothing." 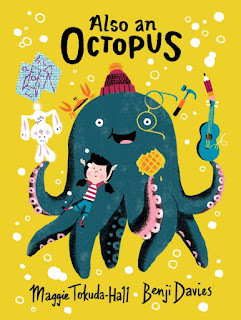 Every story must start with a main character, and so we have an octopus--a ukulele-playing octopus wearing a cute knit cap. "But in order for it to be a story, and not just an octopus, that octopus needs to want something." Here, our octopus wants a rocket ship, "a totally awesome shining purple spaceship capable of intergalactic travel." But don't be fooled--you can't just go down to your local store and buy one; you have to make one. "I'm not really qualified to build a spaceship...But it does smell like waffles! So that's nice." With whimsy and delight, Tokuda-Hall shows young readers the writing process, introducing introducing story elements key to successful conflict and resolution. Her energetic language and playful premise are matched by Davies' bright digital artwork. 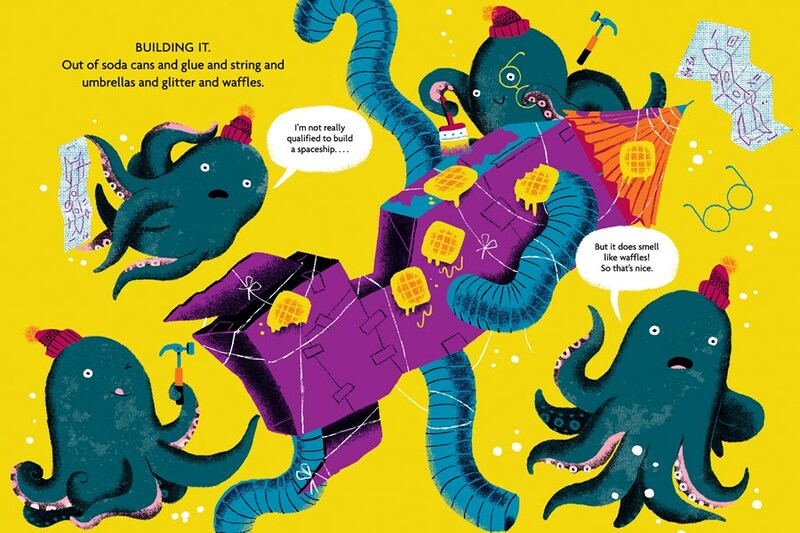 Just look at the octopus trying to build a purple spaceship out of "soda cans and glue and umbrellas and glitter and waffles"! Talk about a recipe that's going to bring laughter from the storytime crowd. Young writers will see how a character's desire and the obstacles it faces are key to keeping a story moving. What makes this story stand out is how the narrator's instructions are blended with silly examples and punchy humor. 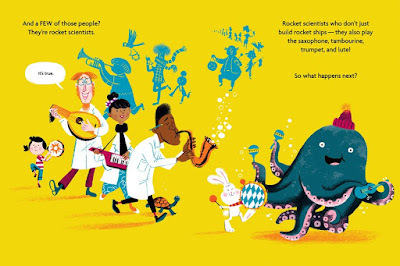 Just look at the rocket scientists who come along to join the octopus's band. "Rocket scientists who don't just build rocket ships--they also play the saxophone, tambourine, trumpet and lute!" Kids will love the goofy humor, vibrant illustrations and silly twists that keep the story moving quickly. But the real joy is the way the story ends by encouraging young storytellers to jump right in and try it for themselves. When one story ends, it's just making room for another story to begin." A perfect invitation for kids to tell their own stories, this will make a delightful read-aloud at home, in the library or at school. Illustrations copyright © Benji Davies, 2016, shared with permission of the publisher. The review copy was kindly sent by the publisher, Candlewick Press. If you make a purchase using the Amazon links on this site, a small portion goes to Great Kid Books. Thank you for your support. High in the Berkeley hills, kids clapped like crazy for author Kekla Magoon today as she shared her Robyn Hoodlum fantasies--Shadows of Sherwood and Rebellion of Thieves--exciting, modern twists on classic Robin Hood adventures. Fourth and fifth graders wanted to know all about her writing process. They left not only eager to read her books, but also seeing themselves in her stories and as writers. People always want to know where her ideas come from, Kekla told students, and that isn't an easy thing to answer because sometimes they come when she's just walking down the street. "My ideas come from my experiences--things I know well, like my feelings, my life. But they also come from my questions. What would it be like to live in a different time, in a different place, as a different person?" What if are two powerful words. Shadows of Sherwood began with these sort of questions: What if Robin Hood was a girl? A teen? Living in a modern city? What if she was biracial? "I loved the way Robin Hood is always looking out for everyone in his community and helping other people," Kekla told students. But I wanted to think about these stories I loved as a kid with a modern twist. Robin Hood movies clearly are still popular with kids today -- the crowd loved it when Kekla showed images from different Robin Hood movies, and they instantly recognized the Disney version especially. Students also responded to the deeper ideas Kekla talked about. "Robin Hood is essentially a social justice story about equality and giving people opportunity." Our students connected to the issues of civil rights, and some were surprised to learn that kids played an important role in the Civil Rights movement of the 1960s. Fourth and fifth graders definitely think concretely, but they're ready to start considering bigger issues in the world. "Did you get help writing your stories?" one student asked. "Yes! Definitely!" Kekla told the crowd. But there are different types of writing she does. Some writing is personal, just for herself--in a journal, or ideas she's trying out. Other writing is specifically for others to read, and so she has to think about if it communicates her ideas to other people. That's when she shares it with friends and her editor, so she can see if it's communicating the story and the ideas the way she wants it to. Kekla ended the visit talking about rain, which becomes a symbol in the Robyn Hoodlum stories. A single raindrop doesn't affect you very much, but when a whole lot of raindrops fall it creates a big impact. That's what happens with social movements and protests, she told us. "Your part may seem small, but when you add all your voices together, they add up and can create a real impact." Rebellion of Thieves, the second Robyn Hoodlum adventure, was published last week. I can't wait to hear how our students respond to both of these stories. 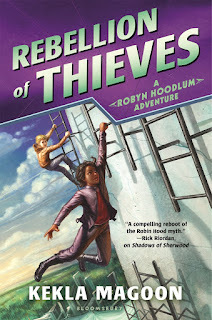 Many of last year's fifth graders loved Shadows of Sherwood--they loved the exciting adventure and could connect to Robyn being such a gutsy girl. It's going to be terrific seeing a new group of 4th and 5th graders share in this excitement. 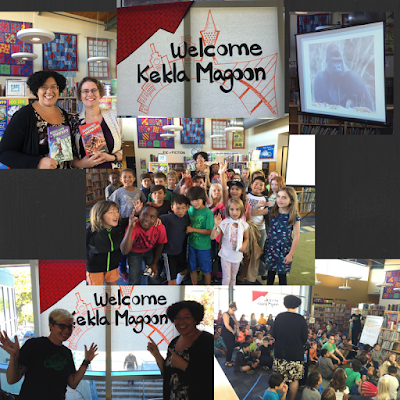 Many thanks to Kekla Magoon for taking the time to visit our students and share about her writing. Special thanks to her publisher Bloomsbury and our local bookstore Mrs. Dalloway's for making this visit possible. And extra special thanks to my colleagues J. Stewart, the Cragmont Librarian, and Becca Todd, our terrific district library director, who pulled off this visit with energy and enthusiasm! The review copy was kindly sent by the publisher, Bloomsbury. If you make a purchase using the Amazon links on this site, a small portion goes to Great Kid Books. Thank you for your support. Halloween is an exciting time -- candy, costumes, parades! Here are five books to share with kids just beginning to read that build on the Halloween fun. They have short sentences, lots of picture support and predictable stories -- all elements that help new readers build confidence. Boo, Katie Woo!, by Fran Manushkin -- Katie Woo stories are full of situations that kids can relate to. In this story, Katie is disappointed that her monster costume does not frighten anyone--and has to figure out how to have fun even though she's disappointed. Our 2nd grader readers love the Katie Woo books in chapter book form, like Katie Woo Celebrates. 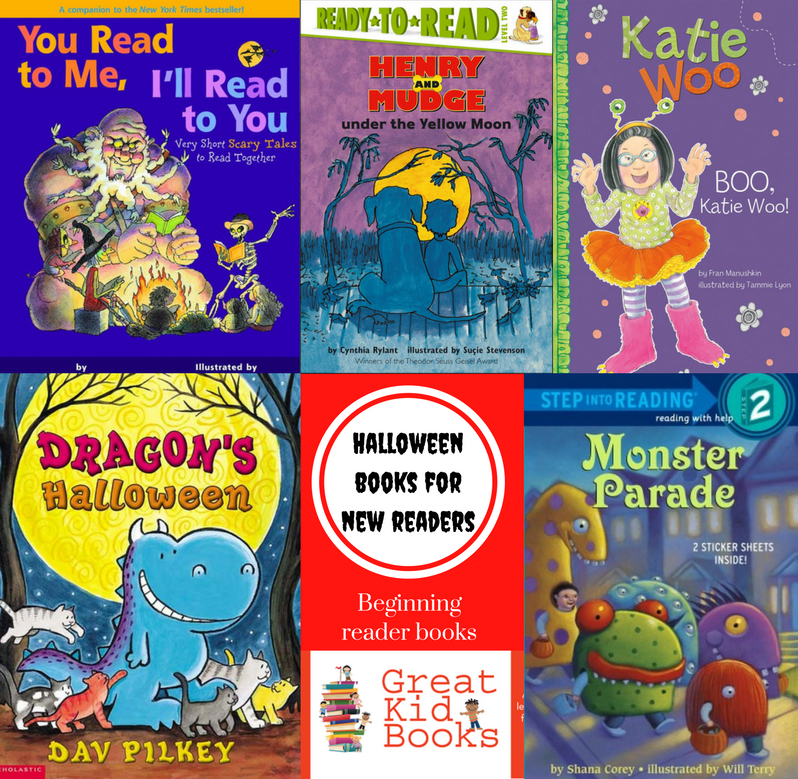 Dragon's Halloween, by Dav Pilkey--Silly, endearing Dragon goes to the pumpkin patch wanting to make scary jack-o'-lanterns, but how's he going to do that with the six little pumpkins that are left? Dragon also has fun going to a costume party and taking a walk in the spooky woods, with three different short chapters. Henry and Mudge Under the Yellow Moon, by Cynthia Rylant--Henry and his giant dog Mudge are favorites of our beginning readers. Halloween's scary stories can be frightening, but Henry is reassured with his best friend Mudge at his side. 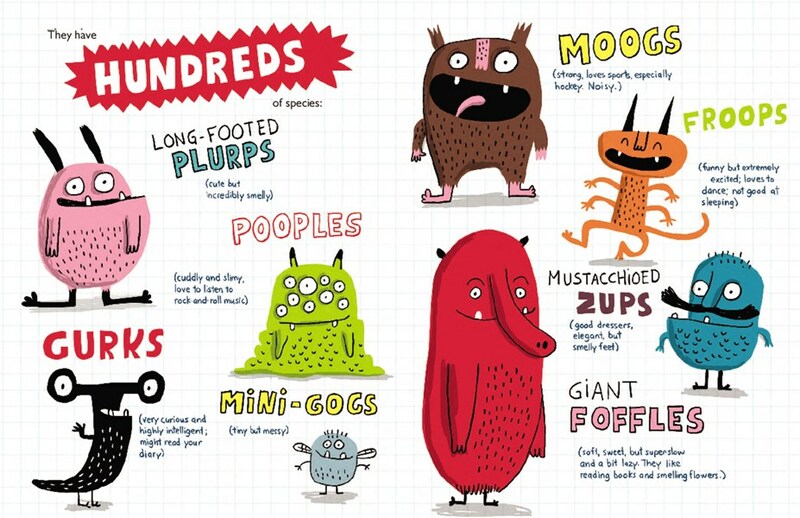 Monster Parade, by Shana Corey--Simple rhymes make reading aloud fun and help new readers predict what's coming next. "Monsters munching, / monsters crunching, / monsters chomping, / monsters stomping!" The neighborhood children put on their costumes, march in a Halloween parade and head out for some trick-or-treating. You Read to Me, I'll Read to You: very short scary tales to read together, by Mary Ann Hoberman--I love sharing these short rhyming stories that are designed to be read aloud by two voices. They're great for parents to read with new readers, taking turns with each stanza. These goofy-scary stories use spooky settings and plenty of monsters to express the joys of reading. Review copies came from our school library. If you make a purchase using the Amazon links on this site, a small portion goes to Great Kid Books. Thank you for your support. The images that you form in your mind--I describe it as a "movie in my mind"--are key to developing students' understanding of a story. This personal movie also hooks them into the excitement of a story. 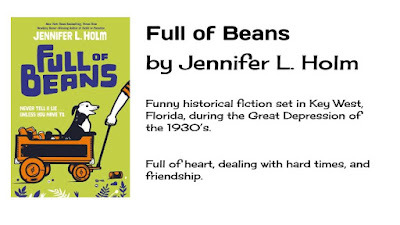 I put together a short presentation to help my students visualize Jennifer Holm's delightful story Full of Beans, as part of our Mock Newbery Book Club project (see my full review here). When a story takes place in a different time or place, it's especially important to help kids get a sense of the setting of the book. Historical fiction can bring alive distant time periods, but we also need to remember that kids may not have the same frame of reference that adult readers do. While the Great Depression conjures many images for me, I doubt that it does for many of my 4th and 5th graders. Sharing this slideshow helped right away! It made kids interested -- we started talking about why the streets might have been full of garbage, and what it would be like if the city didn't have enough money to pay garbage collectors. We talked about rum runners and what they were, why they had to smuggle rum into Florida. It also helped students visualize the story right from the beginning. That afternoon, Kalia came to me to tell me how she understood why the streets in Key West were full of garbage. 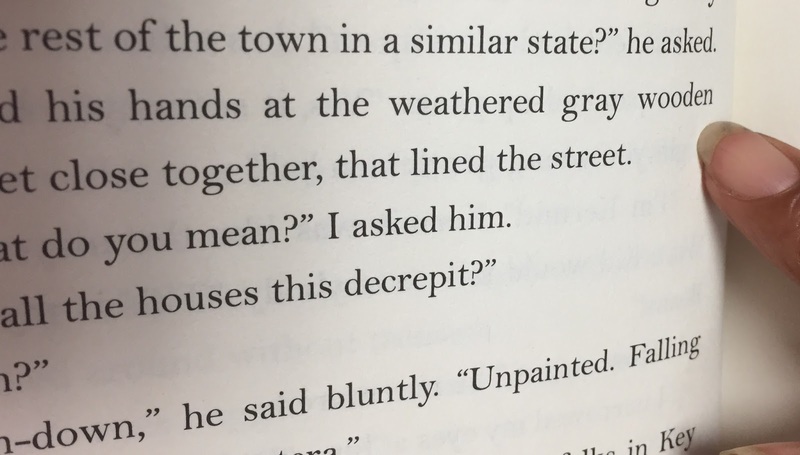 Right on page 8 (see this passage in Google Books), it describes the houses as "weathered gray wooden houses, set close together." 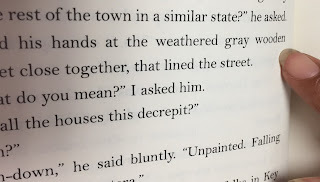 Holm describes them as "decrepit"--a word that might be challenging for Kalia. Because we looked at these pictures before reading, Kalia was able to get a sense of the story right from the beginning. Isn't that terrific?! Now, difficult vocabulary isn't a stumbling block, but instead she's building her own vocabulary. How do you help your kids make these movies in their mind? What do you find helps? I'm excited to get my students working together to make slideshows like this -- helping share the movies in our minds about the books we love. Latino students are the fastest growing group in American schools. I was particularly struck last week by a new report highlighting this (see this NPR article), and how much it matches my own experiences as a teacher and community member. The report by The National Council of La Raza finds that Latino students are making significant gains, increasing high school graduation rate, but that challenges remain--especially with reading. How can books help change this? Latino students need Latino role models, especially in the stories they read. This is especially important for girls. We must provide stories that include and share their voices. 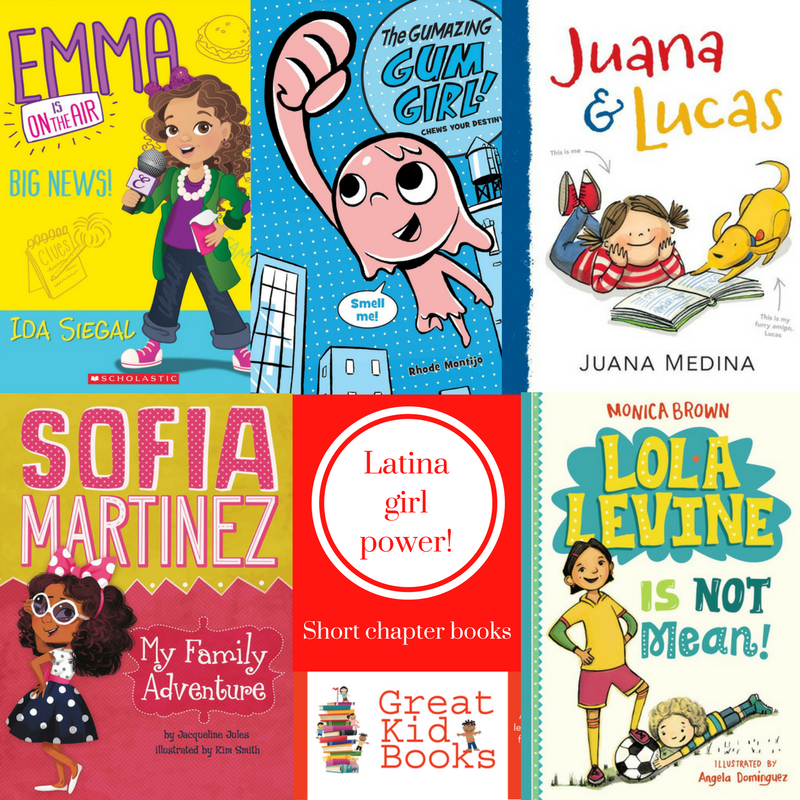 So today, I'd like to share five chapter books full of Latina girl power. 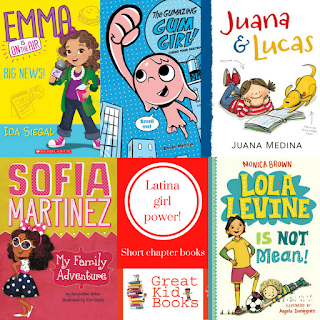 These new short chapter books feature strong, lively Latina girls. They are energetic and fun, with a modern sensibility. These girls solve problems, tackle challenges and embrace the love that their family and friends bring them. Most of all, they bring joy to our students, making reading a joyful, meaningful experience. Chews Your Destiny: The Gumazing Gum Girl, by Rhode Montijo -- When Gabby Gomez realizes that a piece of special gum gives her stretch-tastic superpowers, she’s thrilled, discovering all sorts of ways to help out those in need. Big News: Emma on the Air, by Ida Siegal -- Emma Perez dreams big and bold. She wants to be FAMOUS! When she sees an investigative reporter on the TV news, she knows that this is just the career for her. Juana and Lucas, by Juana Medina -- Juana is an energetic, opinionated Colombian girl, who loves drawing, reading comic books and playing fútbol. but learning English is muy hard. Readers will enjoy Juana's high-spirits, zest for life and sense of humor, even as she struggles with one disaster after another. Lola Levine Is Not Mean, by Monica Brown -- Lola's personality shines through in this series opener, as she apologizes to a classmate after fouling her in a soccer match. Although some kids tease her, calling her Mean Lola Levine, she shows them that she can be a Soccer Queen. Her bicultural family--Jewish, Peruvian--is an important source of humor and delightful inspiration. My Family Adventure: Sofia Martinez, by Jacquline Jules -- Seven-year-old Sofia likes to stand out in her family. She does all sorts of things to get noticed -- from wearing a huge hair bow to making her grandmother a piñata for her birthday. This early chapter book is full of charm and kid appeal. I must say that I have had a much harder time gathering a collection of books with young Latino boys as the central characters. I'd love any recommendations you might be able to share. Many thanks to these publishers for kindly sending review copies: Disney-Hyperion, Scholastic, Candlewick, Little Brown, and Capstone. If you make a purchase using the Amazon links on this site, a small portion goes to Great Kid Books. Thank you for your support. I love how books can inspire kids' creativity--whether it's informal play (creating forts and reenacting favorite books), doing crafts inspired by a story, or making a Halloween costume based on a favorite book. It's especially fun when an author includes direct encouragement for kids to try making a character at home. 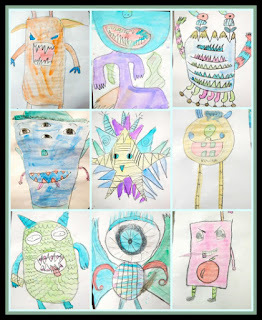 My kids loved making monsters when they were young -- big, scary monsters and goofy, silly ones. 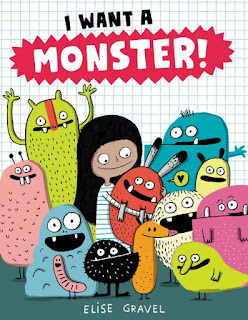 Elise Gravel's newest book would have delighted them and led to even more monster creations. 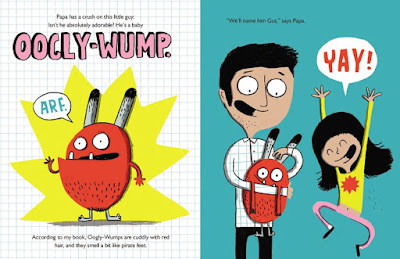 Winnie wants a monster for her very own, so she does what any kid would do--she begs her papa: "Please, please, pretty please?" At first, her father is quite reasonable and wants to know exactly who's going to take care of this monster. But he quickly gives in, falling in love with a cute monster himself. "Papa has a crush on this little guy. Isn't he adorable?" Elise Gravel combines bright illustrations and expressive, energetic characters with lots of dialog bubbles to really draw young readers right into the story. Young readers will love chiming in, adding sound effects or interjections. Best of all are the monsters--which one will your family want?!? 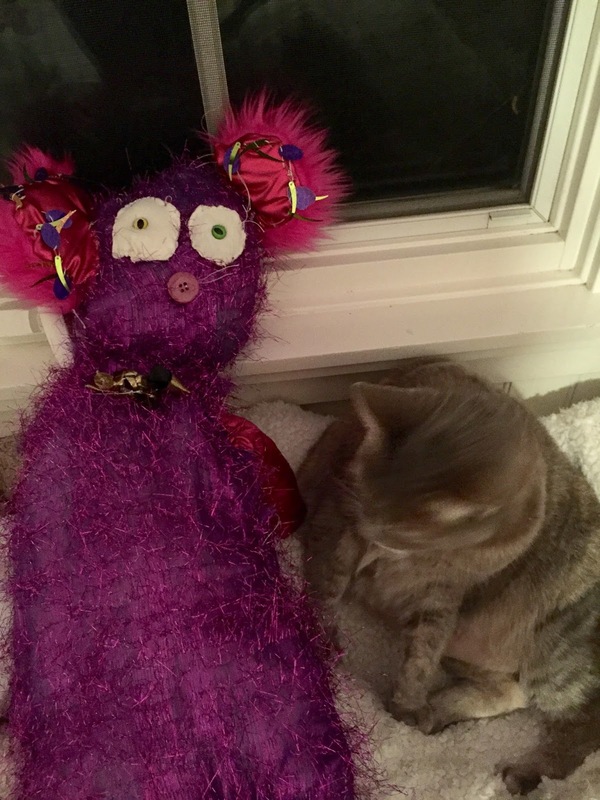 Winnie ends the story by asking readers, "Would you like to adopt a monster?" After you draw a monster, of course you'll need to name it, describe it and decide just what it likes to eat. Here are some delightful monsters that Carrie Gelson's class drew--read all about their inspiration at Carrie's blog There's a Book for That. "I never wish for you to be anyone except yourself," Amah said, looking into Pinmei's eyes. "I know that when it is time for you to do something, you will do it." Young Pinmei often feels frozen by fear, caught in the moment when she is so afraid that she cannot act. Yet her grandmother (Amah in Chinese) has the utmost faith in her, knowing Pinmei will step forward, bravely taking action when she needs to. 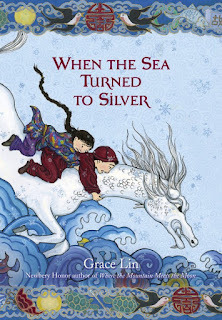 Grace Lin's magical, lyrical new novel When the Sea Turned to Silver captivates and enchants readers, as Lin draws us into Pinmei's adventure. 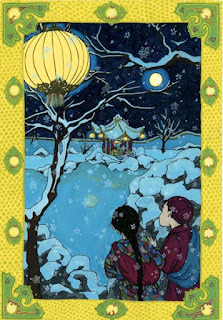 This companion to Lin's award winning book Where the Mountain Meets the Moon is a perfect read aloud for families. As the novel opens, young Pinmei lives high on Never-Ending Mountain with Amah, a famed storyteller. Winter has a firm grip on the mountain, and their rice is running low. Suddenly, Amah tells Pinmei to hide and soldiers burst into their home. Pinmei watches in horror as the Tiger Emperor and his soldiers sieze her grandmother, taking her captive. "The soldiers growled in unison, the sound swelling into a snarl. And then, in a swift, brutal motion, like a monstrous snake swallowing its prey, the men swept Amah into the blackness of the night." Throughout the story, Lin's descriptions enchant the reader, drawing us deeply into Pinmei's ancient Chinese world. Her story is full of figurative language, yet the exciting action and drama keeps readers focused on what will happen next. Pinmei's trusted friend Yishan pulls her to safety, and together they set out on a quest to find the Luminous Stone that Lights the Night, the one treasure that the emperor has said will set Amah free. As they travel, they encounter kind strangers who help them, in exchange for hearing Pinmei tell her grandmother's stories. Lin's beautiful, full color illustrations highlight key moments in the story. Pinmei's stories, based on ancient Chinese folklore, intersperse the main narrative and weave into the main action as well. As Kirkus states, "Elements and characters from these folk tales feature in Pinmei’s own quest as she encounters such evocatively named figures as Nuwa’s Tear, the Paper of Answers, the Starry River, the Ginseng Boy, the Red Stone, the Iron Rod, the Green Tiger, the Black Tortoise, and the Sea King." Short chapters and dramatic action will hook young readers, while those familiar with Lin's previous stories will revel in the recurring themes and motifs. This is a companion to Where the Mountain Meets the Moon and Starry River of the Night; unlike traditional series, these stories can be read in any order. The recognition is just starting to accumulate for this masterful story: nominated the 2016 National Book Award for Young People’s Literature, starred reviews from Kirkus, SLJ, Publisher's Weekly and Booklist. I am looking forward to hearing our students' thoughts as they start reading and responding to this magical story. The review copy was kindly sent by the publisher, Little Brown, and we have bought multiple copies for our school libraries and classrooms. If you make a purchase using the Amazon links on this site, a small portion goes to Great Kid Books. Thank you for your support.